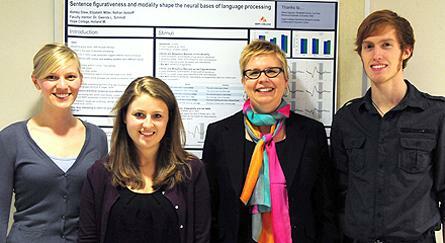 Schmidt, who is an assistant professor of psychology, and her team received the recognition for their project “Sentence Figurativeness and Modality Shape the Neural Bases of Language Processing.” The students with whom she conducted the research are sophomore Nathan Axdorff, a psychology major from Grand Rapids; senior Ashley Drew, a psychology major and neuroscience minor from Spring Lake; and senior Elizabeth Miller, a chemistry major from Lake Saint Louis, Mo. The competition is open to junior social science faculty who worked with students on a significant research project, with at least one of the students returning for the next academic year. The selection is made from among the eligible social science projects highlighted during the college’s annual Celebration of Undergraduate Research and Creative Performance, which was held on Friday, April 13, this year. The study considered whether or not there are differences in the brain when an individual is confronted with literal, metaphorical or nonsensical (anomalous) statements, and whether or not the statements referenced sound or motion. The study used the department’s EEG (electroencephalography) system to measure N400 waves (an index of semantic processing), finding larger N400s and a different scalp distribution for metaphorical statements than for literal ones. The auditory sentences also had a different scalp distribution than the motion ones, indicating that they each have different neural processing mechanisms. Schmidt has been a member of the Hope faculty since 2009. She completed her Ph.D. at Colorado State University in 2006 and a postdoctoral fellowship at the University of Pennsylvania in 2009.